Not all fishing boats are created equal. Spend just a little time in a few different models and you’ll quickly discover for yourself that the fit and finish varies dramatically, as does the on-water handling and since ‘how you do anything is how you do every-thing’, ultimately the longevity of the boat var-ies as well. 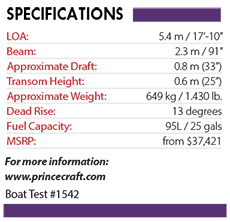 Princecraft hulls are built using aluminum rivets to fasten the 1.8mm thick aluminum single piece hull side to the 2.5mm thick bottom. The bottom is double plated both at the chines and half way back to the stern from the bow. The rivets – long debated as to whether they are better or less than an aluminum weld joint – are the same fastening system used in commercial jetliners and school busses – allowing for flex when needed and reducing metal fatigue for longer life. The entire hull is H36 aluminum which is 25% harder than the aluminum alloys used by some competitors. The new-for-2019 Hudson 170 DLX WS sat dockside at their media testing days this past fall, with a PRO XS 150hp Mercury outboard on the transom. Finished in a blue painted hull with grey interior it was bright given the overcast day. As I climbed aboard, I noticed how stable the hull was at rest. There’s a 3-step reboarding ladder on the transom, and a full beam folding rear bench seat in front of the splashwell. The seat brings your guest capacity up to five, or drops down to make a generous aft casting platform. Underneath you’ll find the battery storage, and a 20 gallon SportFlo aerated livewell with a bait bucket. The two seats are comfortable and dry when running, and both feature no pinch hinges, grab handles and their own cupholder. Perfect for kids! There is rod storage to the port side of the companion seat, and in between the windshield walk thru for up to 10 rods. The windshield itself is high and protects everyone in the cockpit from rain or wind quite well, extending your day or your fishing season compared to non-windshield models. The helm features white-on-black analog gauges and a Lowrance HDS 7 unit mounted flush into the dash for increased visibility through the windshield. The bow area features a bicycle seat mounting base in the centre, affording plenty of room to walk around and yet it’s easy to reach down to the water to bring in your fish. The three-piece bow cushion turns this space into a sunpad for the days the fish aren’t biting very well. The ingenious PrinceTrak system inside the gunwales all around the boat offers the ability to mount your choice of accessories, like downriggers, wherever is comfortable and convenient. We recorded a time to plane of 1.5 seconds which is best described simply as “gone”. 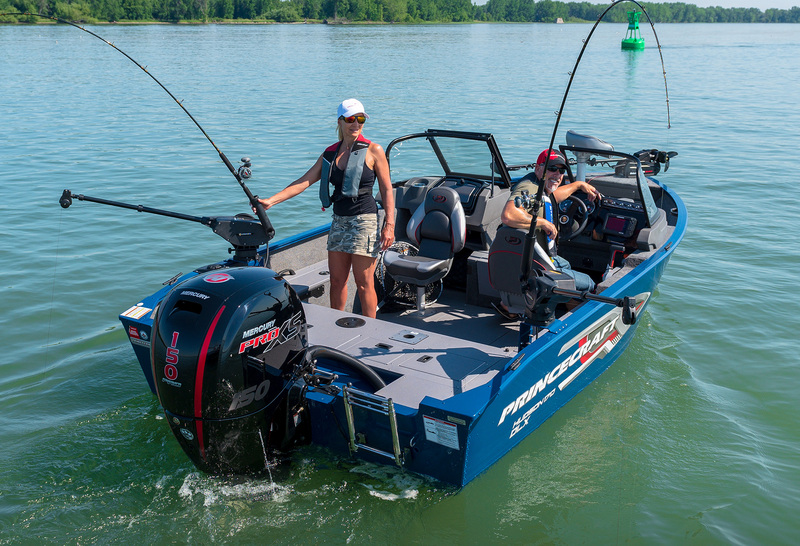 Our top speed from the Mercury PROS XS 150hp outboard was 53.5 mph at 6,000 rpm, with a comfortable cruising speed of 24-40mph at around 3000-3500 rpm with two people aboard and a half tank of fuel. This PRO XS outboard is very quiet at idle, and respectably quiet at speed. The Hudson’s hull is quiet (you have to look twice to remind yourself you’re in an aluminum boat), very predictable and confidence inspiring no matter what input you throw at it from the helm. At just 17’ from the back of the outboard to the swing tongue of the standard galvanized trailer, the Hudson 170 DLX a very ‘garage-able’ boat for the average family to store in their suburban home, saving slip fees or storage lot fees – and allowing you to go see your boat whenever you need a ‘fishing boat fix’.